February 3 is the feast day of the mysterious and kindly St Blaise, who was beheaded for preaching the word of Christ. He is also the man to call upon if you get a fishbone or other object stuck in your throat and is associated with the sacramental Blessing of Throats. One summer’s day in 316, the town square of Sebastea, in ancient Armenia, was witness to a miracle. As the former bishop (known to us today as St Blaise) was being led towards the prison by guards, a mother rushed up to him brandishing her young son. The boy was choking to death from a fishbone caught in his throat. With one hand on the boy’s throat, Blaise called upon the power of the Lord to save him and the child instantly coughed up the bone and began to breathe. To this day Catholics call upon St Blaise for help whenever anyone has a problem with their throat. This might be an incident of choking, nervous swallowing prior to (or during) public speaking or a serious throat illness. 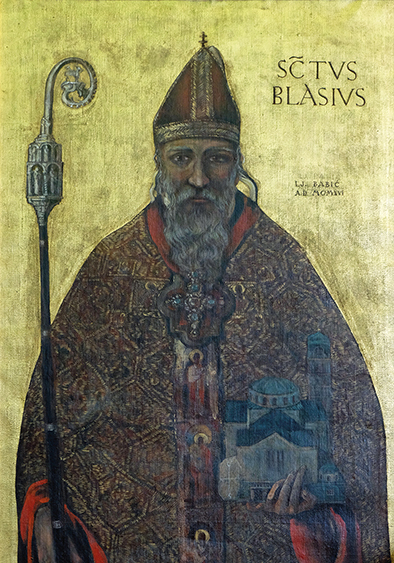 It is said that St Blaise was raised a Christian in a rich household in the town of Sebastea in ancient Armenia, which is now known as Sivas and sits within modern-day Turkey. As a child he had a strong faith and read reams of philosophy. Later he trained as a doctor and used his faith as part of his practice, with incredible results. At this time, the Roman Emperor Licinius was in power. It is said that, on hearing of Blaise’s popularity and strong Christian faith, he actively sought him out with a will to imprison him or worse. Whether or not this is true is lost in the mists of time. Licinius’ rival Constantine the Great (known as the first Christian Emperor) painted him as a bloodthirsty anti-Christian pagan. But this was not true, as Licinius’ wife was a devout Christian. Some historians think that Constantine’s troops hunted Blaise, claiming they worked for Licinius. His remains are said to lie in a church in the coastal town of Maratea, on southeastern mainland Italy, very close to Sicily. The town sits on the slopes of a mountain named after the saint (Mount San Biagio), and its main church (The Basilica of St Blaise), which was built in the 6th century, houses both a silver statue of him and (allegedly) his remains. Every year (on the second Sunday in May) a procession carries the statue from the basilica to the main church of Maratea’s old town. Whether Blaise lived in a cave in Sicily, Italy or Turkey, or all three, he was eventually found by huntsmen, who recognised him to be a bishop by his clothing. It is said that they found the cave by tracking a wild animal who made its way there and that when they neared the cave, they saw many other animals resting there. According to legend, Blaise had the gift of communicating with and healing animals, just like St Francis of Assisi. St Blaise was said to be especially good at calming animals that were aggressive, wild or distressed. The hunters took their bishop to the Roman authorities, hoping for a big reward, and St Blaise found himself being taken back to Sebastea, where he was imprisoned. His jailors beat him and then scratched off much of his skin with wool combs. Then he was beheaded. On 3 February (the day after Candlemas) many people pay tribute to St Blaise, and ask him for healing, by lighting candles. Traditionally, in a ceremony, two candles are held against the throat in the form of a cross and a blessing is said: ‘May God at the intercession of St Blaise preserve you from throat troubles and every other evil’. The intriguing St Blaise’s Well in the grounds of the Bishop’s Palace in Bromley, Kent, is said to be holy and to yield better quality water than Tunbridge Wells! It’s thought that St Blaise is associated with Bromley because it was once a centre of wool trading, of which he is the patron saint. People with throat illnesses go to the well on his feast day, 3 February, to drink the water in the hope of a cure.